Right after our unpromising lunch, we went restaurant hoping again 🙂 This time, we drive our way to the Curve 🙂 I love strolling around at the walkway lined up with various types of restaurants and cuisines especially in the evenings where the pretty lightings filled up the street. We marched our way back to the Curve and on the way, we passed by a signboard full of posters of the eateries promoting their restaurant’s dinner sets, discounts, specialties and stuffs like that. 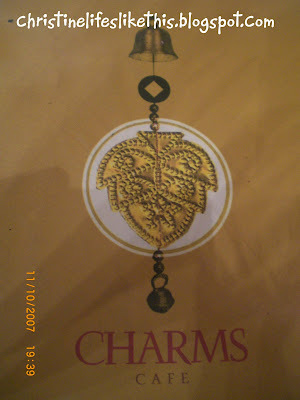 At that time, it was still the Ramadhan month and my attention was drawn towards the promotion offered by Charms Cafe. It stated clearly there: ‘Buka Puasa Promotion‘ a set for 2 for only RM18.90! Me: Hey… that’s really reasonable! 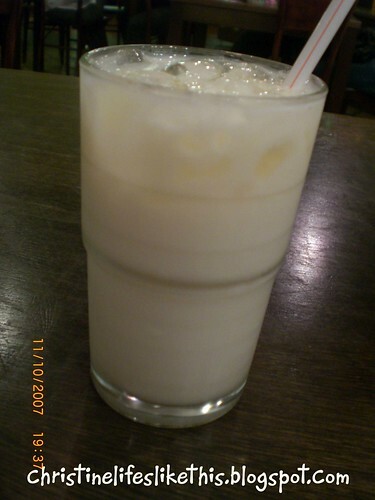 When we reached the cafe located on the ground floor, about 1 or 2 units from Pho Hoa, we walked in with great anticipation. 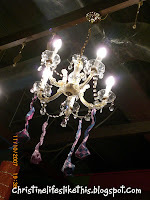 I was comfortable with the interior decoration of this place, with suitable colour combination and artistic effect. 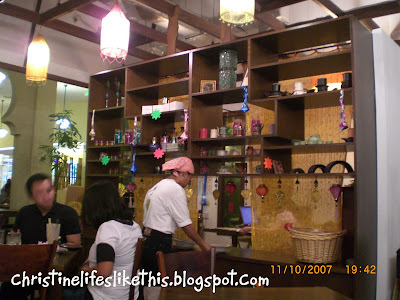 Sort of like the baba and nyonya style, the wooden tables and chairs do match appropriately. Chris: You’re having a buka puasa promotion right? Chris: Huh? I thought you guys are having some dinner sets during buka puasa month? Waiter: Sorry sir. Finish oredi. This promotion… no more. I wasn’t happy at all. Felt cheated to the restaurant.They even had a giant banner hung outside of the restaurant with big wordings of ‘that’ promotion and now they said.. ‘Finished already?’ It was only half the Ramadhan period. Sad. Sad. We ended up ordering from the menu in the end, although we weren’t very fulfilled. Still manage to scrutinize over the menu so that we could have a nice dinner. Don’t wanna be triggered to be unhappy over some minor stuffs. We had the Pineapple Fried Rice for RM11.90. 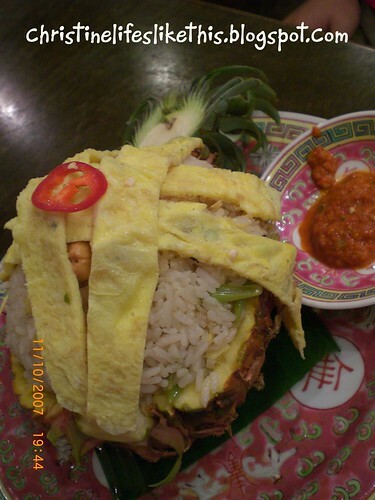 This came well-presented, with the pineapple served filling up with fried rice comprising of chicken meats, prawns, other assorted vegetables as well as pineapples. It was pretty fragrant but not incredible. 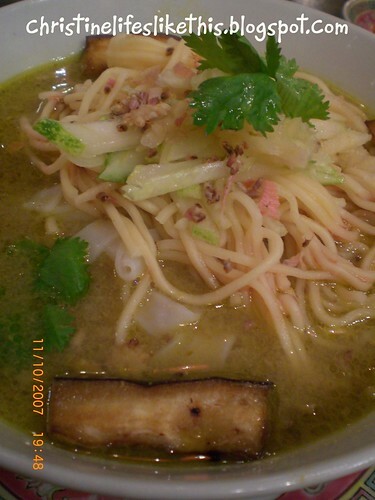 We also had the Green Curry Noodle. Most people would definitely prefer their curry mee with meehoon, but I still prefer mine with kuey teow and yellow noodle. Doesn’t look that charming isn’t it? Tastewise, it was not bad. Very flavourful but somehow we find the curry broth not thick enough. A thicker green curry would be yummier for sure 🙂 and.. For RM9.90, not much ingredients were served. Kinda pricey with only some prawns and 4 ‘bars’ of brinjals..
Hmm… Does not seem like a good choice I guess since there’re so many more better restaurants in the curve! Yeah, the banner thing is kinda deceiving. next time better ask before taking da seats. they should have removed the promo if not available anymore. I love there BBQ lamb so exciting, yet so delicious! hmm… the one in 1-U is better ? i like the deep fried chicken giblets with chili padi ~ yummy !! If no promo anymore, should walk out! But hope the food was still good. If not, I would have felt worse!!! Oh too bad! I hate the feeling kind of been cheated. Anyway, the pineapple fried rice looks ok. I saw their place is empty even on weekend. yea..I don’t think I’ll plan any revisit so soon. Bad impression. I should have 🙁 Not really good but still acceptable.